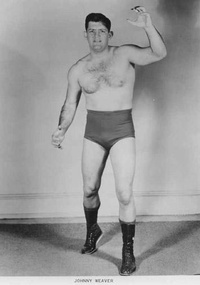 Kenneth Eugene Weaver (November 17, 1935 " February 15, 2008) was a professional wrestler and wrestling commentator in the National Wrestling Alliance, better known by his ring name, Johnny Weaver. During Johnny's career, he was credited with being the first wrestler to use the sleeper hold (rear naked choke) as his finisher of choice. This webpage uses material from the Wikipedia article "Johnny_Weaver" and is licensed under the GNU Free Documentation License. Reality TV World is not responsible for any errors or omissions the Wikipedia article may contain.